Oil prices are more volatile than they have ever been in the past 10 years, with a lot of uncertainty rising on what direction those prices will take in the future. As a result, it’s becoming ever more difficult for countries and businesses to assess projects and decide their feasibility in the near term. It also makes it hard for countries, as well as individuals, to budget for hikes in oil prices, and to better utilise lower oil prices to remove subsidies or to support businesses. With shifting geopolitics, supply-demand mismatch, and new entrants, volatility and uncertainty in the oil market are here to stay. Looking back at trends over the past 50 years, there were very specific major shocks to the oil market, like the 1973 embargo, leading to a sharp increase and an eventual drop to a price at which supply balanced out demand. Similarly, uncertain supply with higher Asian demand increased oil prices post the year 2001, resulting in a pre-2008 peak and another in 2011. But this is no longer the case. What has changed is that shifts in prices are more extreme and take place over shorter periods of time instead of taking years to flatten out. Geopolitics and uncertain supply cannot be separated from one another. And despite the widely circulated rhetoric that countries like the US may be a major player in the oil market one day, such predictions fail to account for two points. One, shale oil, which is what’s bringing the US to self-sufficiency in oil post-2021, requires different refining, with many oil refineries around the globe being accustomed to the type of oil that they have been importing for years. This means that we are far from witnessing dramatic changes in terms of suppliers. Additionally, with countries having to cut down their production due to sanctions and others doing so because of turmoil, it is only expected that tightness in supply will grow further, with unfettered demand. This brings me to the second point, which is that demand for oil is expected to outgrow supply in the long-term. 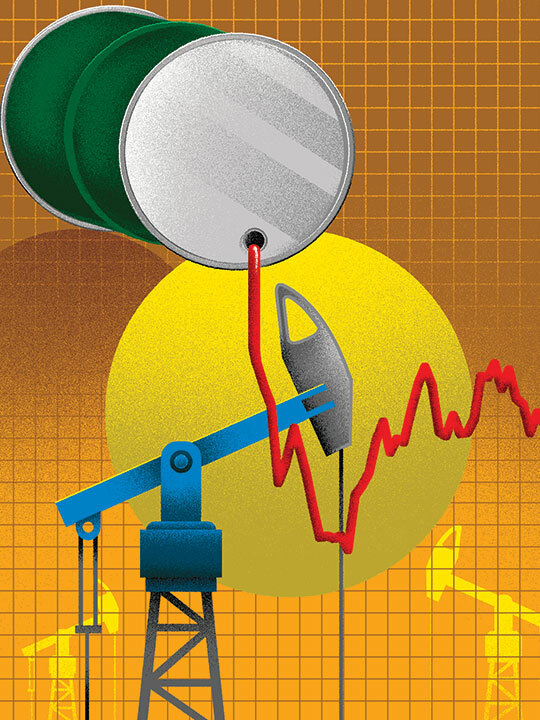 Though this is yet to be observed and confirmed, a reversal in oil prices in the past five years is one indication of the same, but not one that can be taken for granted. Such demand — if moderated by energy supplies from other sources, including biofuels and renewables — could be significantly lower than anticipated. The result would be a more balanced market with less volatility in oil prices than what we are observing today. Furthermore, new oil production in various regions is coming online, such as Uganda in Africa and Guyana in South America. Russia, along with countries in the European Union (EU), possess significant shale oil reserves. However, France and Bulgaria, both EU countries, have banned the process of extracting shale oil, known as fracking, due to its negative environmental impact. Though it is hard to ascertain where oil prices are headed, there are certain events taking place today and likely going to shape the oil market of tomorrow. Firstly, countries that are able to tap into their oil resources will be able to move closer to self-sufficiency, and so will their nearby regions. As that takes shape, dynamics in the oil market will no longer be determined by straight forward demand and supply, but rather how much energy does a region require as part of its total mix of all energy sources. Therefore, today’s players in the oil market will not necessarily be tomorrow’s players. In fact, this can be only assessed and forecast by taking into account potential and progress in oil producing regions to determine excess supply, and hence exports. Tomorrow’s players in the oil markets will be regions with the highest exporting capacity, not countries. Secondly, traditional oil producers and exporters are now moving up the supply value chain to safeguard against future unpredictability, with mergers taking place to consolidate operations and streamline investments. Mubadala Investment Company in the UAE, established through the merger of Mubadala Development Company and International Petroleum Investment Company, is one example. Another is the merger of Oman Oil Co and Oman Oil Refineries and Petroleum Industries Co.
Thirdly, oil prices have been pushed to the extreme by speculation, not by a sudden surge in demand or a sudden drop in supply. When oil prices started dropping post-2014, oil supplies were stored on ships, oil tankers, rather than admitted into the oil market. While one reason was to keep excess supply off the market and hence upward pressure on oil prices, the other was for investors and speculators hoarding oil barrels to sell them at a price that seemed destined to continue rising. This also enabled them to honour their options contracts in an oil market where prices were increasing unabated. One general observation in the commodities’ market is that prices stay on a mild upward trajectory in the long-term, even if there were steep pitfalls along the way. But if and only if there were no major changes in the supply-demand dynamics. Therefore, and with an overall growing demand for oil, and its by-products, it is only expected for the price of oil, taken on average every decade or two, to be higher than in preceding ones. However, such a growing demand will not be necessarily supplied from today’s traditional players, with growing self-sufficiency from domestic and regional resources, inclusive of other sources of energy that, in net, would reduce dependence on oil. How oil prices will be impacted is anyone’s guess. The last thought that I want to leave you with: what about the markets for gas and Liquefied Natural Gas (LNG)? Abdulnasser Alshaali is a UAE based economist.